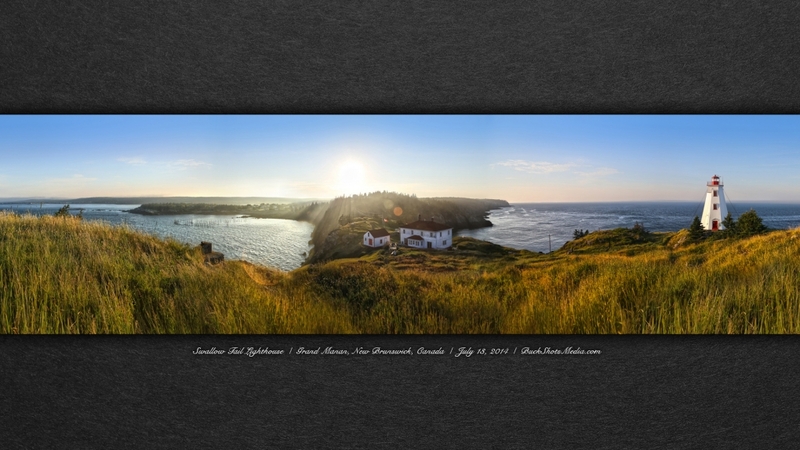 Here is the Swallow Tail Lighthouse on Grand Manan Island in New Brunswick Canada. I walked out to the point about an hour before sunset and couldn't have been more thrilled that I did. To the Southwest (my left) was a huge wall of fog on the horizon. I looked around for a good angle to take a few shots (I knew I wanted to composite a few shots together later in post). Everything was happening so quickly that I didn't have anytime to set up my tripod and bracket any shots. I took three shots moving right to left and then realized my camera had a bit of a malfunction (brand new Canon 6D) The camera was reading (and stuck at) 4000 per second. Within a few minutes the fog started to rush up the left side of the cliff and move across the point. 10 minutes later it looked like it should have been 2 hours later. It was an incredible moment and I am grateful I had my camera with me.